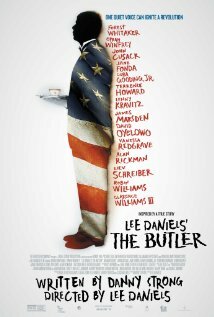 “The Butler” begins with an exclamation point and ends with a question mark. As this week marks the 50th Anniversary of 1963’s “March on Washington” with Dr. Martin Luther King sharing his historic dream before hundreds of thousands, “The Butler” was #1 at the box office for a second triumphant weekend before millions of moviegoers. The film’s first few minutes are not for the feint of heart – a savage encapsulation of deadly oppression – while the last moment is powerfully inconclusive and appropriately so — for that’s where we are. “The Butler” (PG13) ostensibly traces the White House career of Eugene Allen, who served eight U.S. Presidents over the course of 30 years, witnessing sweeping social changes during his three decades of dedicated service at 1600 Pennsylvania Avenue. But this is a movie, not a traditional documentary. For cinematic purposes, Eugene Allen is morphed into a marginally fictional character named Cecil Gaines, brilliantly portrayed by Forest Whitaker – perhaps Oscar-bound again. As was true in the case of “The Last King of Scotland”, a film that won Whitaker his 2007 Academy Award for Best Actor in a powerful portrayal of Ugandan dictator Idi Amin, “The Butler” is a fictionalized chronicle, so leave your fact checker home. That observed, it nonetheless presents an extraordinarily encompassing mosaic of recent American history with a sharp black perspective rare in its raw revelations. It centers on a continuing struggle for civil rights, an effort only partially realized in our times with mileposts reached, but great distance remaining. Timing couldn’t be more perfect, perhaps the primary reason our local Oakhurst audience burst into appreciative applause as final screen credits rolled – an enthusiastic endorsement of the movement at least as much as the movie. In a serendipitous prelude to “The Butler”, Rachel Maddow appeared last week in a live MSNBC broadcast from Boone, North Carolina, where voting in Watauga County has been reduced by a new Republican controlled County Board of Elections from three separate precincts to a single, barely accessible polling place for over 9,000 registered voters, including students at Appalachian State University, a predominantly black institution. Simultaneously, the GOP chair of the Forsyth County Board of Elections is attempting to shut down an early voting site at Winston-Salem State University – another minority school. And the Pasquotank County Board has just proclaimed students at Elizabeth City State University with a majority African-American enrollment ineligible to cast local ballots in November. All of this is happening in tandem with passage by the North Carolina State Legislature of what has been generally referenced in the national press as “the nation’s worst voter suppression law.” Let it be noted that the theoretical excuse for such a draconian measure –“widespread hidden voter fraud” – accounted for far, far less than one percent of all votes cast in North Carolina in 2012 – actually .00174%. I herein salute General Powell for such prescient commentary and praise Ms. Maddow for bringing desperately needed focus to these virulent attempts at reviving the soul-scarring, rights-robbing, humiliating ghosts of moldering Jim Crow legislation, now rising from the dead like vampires at dusk. And such things do not exist in sterile isolation. “The Butler” serves up significant food for serious thought. It is not so much a summary as a summons. Work undone remains justice unknown. But not unreasonable, undeniable or unobtainable. It’s all up to – just us. This entry was posted on August 26, 2013 at 9:47 am and is filed under Uncategorized. You can follow any responses to this entry through the RSS 2.0 feed. You can leave a response, or trackback from your own site. If they offered free beer at the barely accessible voting place, the students would find their way there. If there is a will, there will be a way. Do they need photo ID? I hear the dead don’t photo that great.